I thought it might be fun to make a display of how Miniature Art can be displayed and enjoyed. Micro Art Gallery : I have used a very affordable box frame, removed the mount and glass and arranged some of my art to give a miniature Gallery effect in a unique and fun way. 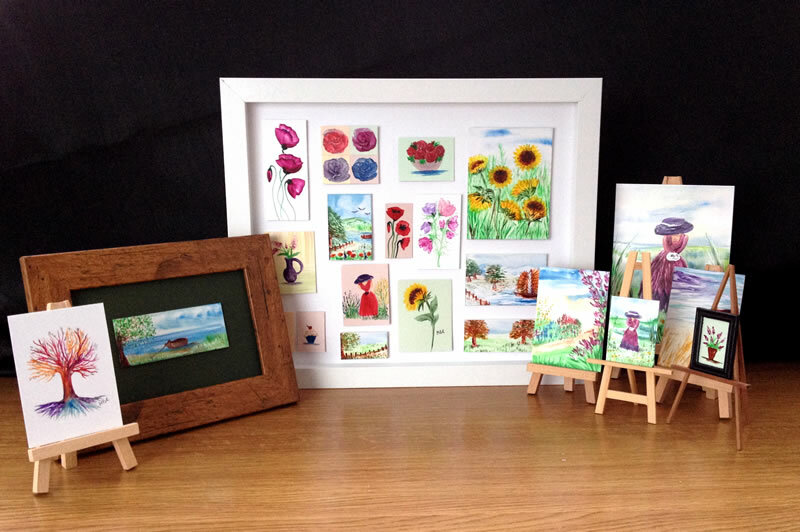 Miniature Easels and small frames also make a great way to display tiny art ……. As you know if you read my blog or have looked at my website I paint “Art In Wax” I work in specialist wax paint using heat tools to melt the wax and paint with it using brushes, stylus tools, much like a artist palette knife but hot, a hotplate to work on or melt wax and even hot air to move and merge the wax. I paint in many sizes, large wall art and in miniature. I started painting small, mostly ACEO collectible size several years ago and for the past 18 months have painted even smaller which I sometimes refer to as Dolls House Art as many of my tiny pieces of Art In Wax are now in Dolls Houses across the world. I have my own miniature Art Gallery that my husband Adrian built for me last year, you can see pictures of it on the blog here at the Grand Opening . Since doing that post The Gallery has lots of new pictures and exhibits a lot of my new miniature Art. Miniature art is a great way to be an Art Collector. I know that some collectors of ACEO miniature artworks that have bought my Art In wax display them in collections, in albums or on mini easels, I myself have many small paintings displayed on easels of different sizes and styles. From the feedback I have had, I have been told people have bought Art In Wax miniature art, as art for themselves, one lady has a piece on her desk at work and others have told me it is a great way to own original art when you don’t have a lot of wall space. Do you own miniature Art ?